Solitaire fun for the whole family! Can you save the world from the Zombie invasion? Play your cards right and prevail in numerous adventures to thwart the epidemic! A hot lead to the ultimate Zombie hangout fills you with new hope. So get going and master exciting solitaire matches, sugar sweet Match 3 duels and lightning fast time management battles. Get ready for the most hilarious showdown ever! 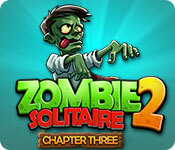 Zombie Solitaire 2: Chapter 3 is rated 3.9 out of 5 by 16. Rated 5 out of 5 by fredandethel from Easier than the earlier chapters In the first 2 chapters I had to replay levels to earn more money in order to buy enough bonuses to get through the harder levels, but here there are lots of free wild cards and zombie killers among the cards. As in other chapters you have to replay some of the game before you find all the collectible stickers. Love the new zombie killer minigame. Rated 5 out of 5 by Katie318 from Fun diversion It's been a while since I downloaded a game from BF and played it for several hours. What fun this game is! Made me think and laugh while not taking itself (or me!) too seriously. The "one up one down" solitaire is fairly easy but I love the mini games and in particular the hiatus moments when you decide what to do...LOL...no spoilers. Give it a shot. I bought it after the trial and have no regrets. Rated 5 out of 5 by luvmy3bigboyz from Love this solitaire series! I love this series! Strange, because normally I am not a zombie freak. But this is tastefully done (no eating brains) and there is humor in the storyline. Even the zombies on the cards are comical. The powerups make the game win-able and it is not so difficult you are hopeless to go on to the next level. I have the original zombie solitaire and each one in the chapter series. I can't wait until the next one comes out! The duration is not so long you get fed up and the in-between challenges change it up just enough. Great solitaire! Rated 5 out of 5 by deddu from ANOTHER FANTASTIC ZOMBIE GAME I have played all these games and this one has some new features -- fighting the Zombies -- you have to be quick or you lose. The solitaire is up/down as before and seems a little easier as there are more helpers in the actual level. There is also a puzzle which I enjoyed -- reform the picture with clear instructions -- going to play again and chose the riddle or question. Rated 5 out of 5 by verimeri from another excellent chapter First of all I just finished replaying the original Zombie Solitaire. It is amazing how much this game has grown and developed. Chapter three is excellent except for a few minor things. I played every single level however many times it took until I cleared every card. But I did not acquire all the stickers. Rather irritating. Also, the mini games. I liked the find all the pieces to this object games and they are missing in this version. In the fight mini games please slow it down. Some of us are older and we simply cannot click that fast. Rated 5 out of 5 by cowclaudia from Welcome back! I love these Zombie Solitaire games and bought this one immediately. Granted it's same old, same old solitaire but who cares - the levels to me are easy and like the music - as one Fishie said sounds Egyptian which is a nice change. It's a great game when you want a change from doom, gloom, ugly faces and hideous monsters. Only con: I HATE those clear the candy levels; drive me nuts. Rated 5 out of 5 by pennmom36 from THEY'RE TRYING TO EAT MY BWAINS!!!!!! In the first Zombie Solitaire, the infamous Tofu Burger had created a Zombie Virus known as Z1. After surviving all the zombie attacks, you finally made your way to a remote island, seemingly unaffected. As luck would have it, someone snuck in a Tofu Burger, forcing you to flee the island to make your way through thousands of hungry zombies. Rumors were circulating amongst the survivor's, that citizens were being rescued if you could just make it to the safety of the helicopter landing site, a mere 100 levels away. But this is a Zombie Apocalypse, and of course, the helicopter crashed, leaving you completely vulnerable to all those bwain lovin' zombies! Chapter 3 opens and you are recovering in a hospital, dazed and confused.....but not yet a bwain eating Zombie, so the saga continues! 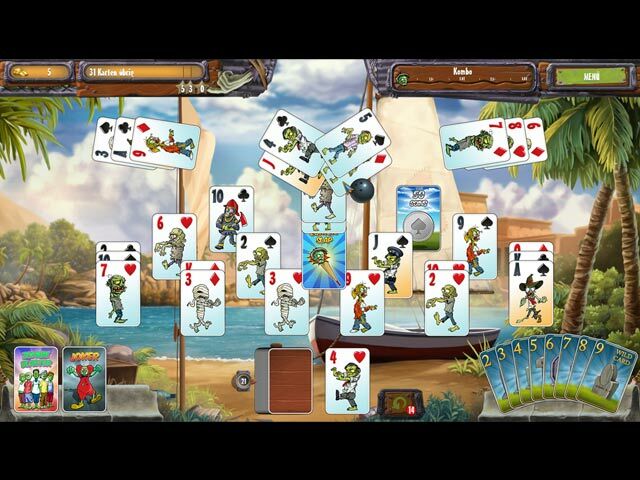 Zombie Solitaire is a Higher/Lower type Solitaire game where you try to make large chains of cards either one higher or one lower than the last card. You will earn coins for each card played, as the coins "fall out" of them and bounce below. I love this feature, however, you can opt out of the bouncy coins within the option settings. Large chains will fill the Combo Meter to earn more points. There is a Star Meter on the top left, that shows how many cards need to be removed for each of the 3 available Stars, and for every level you complete with 3 Stars earned, you will be awarded an extra Undo. There is even an icon that tells you how many deck cards remain, a must-have feature! You can use the coins earned to purchase Bonus Cards in the Shop, Number specific cards, and Wildcard Jokers. There are only 3 slots available at any given time for either the Zombie Slap which removes 1 card, the Zombie killer which shoots 2 cards off the board, the Zombie Blaster which removes an entire row of cards, or the Joker Wildcard which is especially helpful when on a large combo streak. You can earn Sticker Achievements as you progress and once you collect all of the Stickers in a category, you'll be rewarded with extra coins. There are obstacle cards that require you to first uncover the tool card to unblock them. The Bird Deterrent card releases pesky Infected Bird cards, the Machete Card chops through the Jungle Cards, and the Bolt Cutter cards will remove Chained Cards. You can replay any level if you aren't satisfied with the score you received. One of my favorite features in this game was Making Choices along the way. You will come across different choice options, which can sideline your own goals, such as choosing whether or not to help another human in need. You can continue your journey of survival without helping someone, or opt to do the right thing which doesn't necessarily have a favorable outcome, you may have to give up all your coins, all of your wildcards or even both! After a few levels, you can play Mini Games and Hidden Object/Fragment Scenes. 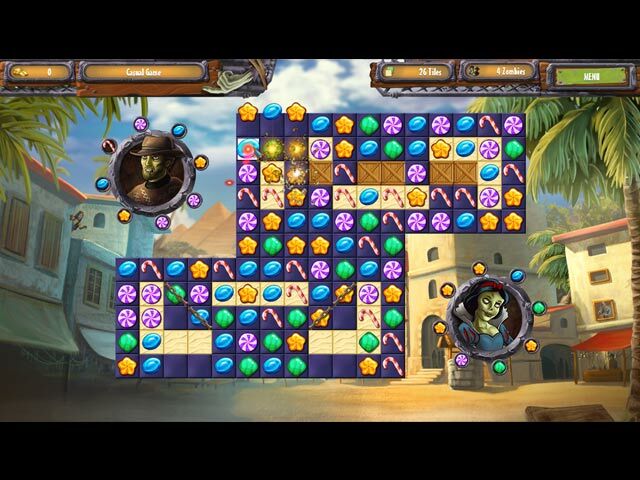 The Match 3 game is available in Casual or Normal limited moves mode, but in the casual mode, you can only win 1 star vs. up to 3 in normal mode. The goal is to give the Zombies shown, the type of candy they desire by making matches of those specified candies. I found the Match 3 games to be somewhat difficult to earn all 3 stars in Normal mode, but you can replay the Match 3 levels as often as necessary until you earn 3 stars. They have added a new Match 3 version where Zombies move towards you from right to left with the desired candy choices shown beneath them. You have to click on the candy combinations they desire in sequence, and then choose the correct Zombie to give the candy to, but if they reach the line before they get their candy, you're a goner! ZOMBIE SOLITAIRE GAMES AVAILABLE Title***Release Date***Average Rating 1-Zombie Solitaire (October 2-2013) 4.1 2-Zombie Solitaire 2: Chapter 1 (April 3-2017) 3.9 3-Zombie Solitaire 2: Chapter 2 (October 16-2017) 4.8 4-Zombie Solitaire 2: Chapter 3 (April 18-2018) n/a by Rokapublish: Gernsheim, Germany founded in 2007 (While originally focussing on licensing casual games only, our creative team of developers soon began producing their own games for various genres. Our early efforts were rewarded with a nomination for the German Developer Award in the category "Best Strategy Game".) Rokapublish games: Zombie Solitaire, Tank Operations, Harvest Life, In Vitra, Fantasy Quest Solitaire, World's of Magic, 5 Star Hawaii Resort, Rio Resort, 3D Arcade Fishing, 3D Mini Golf. Rated 5 out of 5 by Ndwelt from More Please I could play this game all day. It has a variety of mini games, although I have to admit, I can never beat the match 3 in normal mode. But I resigned myself to that. The cartoony characters are, can I say this, adorable. How about adorably deplorable? And there are surprises when you get to make your choice in certain situations. Just wish it would have 500 levels, HA! I know we all have a child in us, so have fun kiddies!! Rated 5 out of 5 by twtscat48 from Zombie Thriller! I have all of Zombie Solitaires from the first and now adding this one to my list. I love them all, for me not much else to say but this is not a disappointment. The bonuses change in each version but the same method of play one up or down from the face up card. It was an immediate purchase for me. I recommend this game. Rated 5 out of 5 by LogieBaby from Without a doubt this series is the best of the solitaire games I was extremely pleased to see the 3rd installment of Zombie Solitaire. The opening cut scene illustrating the player as a patient in a hospital reminded me of season one's opener of the great TV show The Walking Dead where the main character Rick Grimes is introduced in a similar fashion to have him learn of a zombie apocalypse. As to the game itself, I am not generally a fan of solitaire games. What sets ZS apart from most in the genre is the tremendous amount of tongue in cheek humor that pervades each installment in the series. Giving the player a respite from continuous card games by including a zombie killing Match 3 is a nice touch. There are "helper " cards to obtain including zombie blasters, zombie killers, jokers, wild cards and occasionally an extra figurine is presented which becomes important later in the game to buy more weapons. Even though there is nothing reminding the player of anything remotely associated with Egypt, the background music is definitely reminiscent of that locale. I got to level 20 when the demo ended. Got to go now since I must acquire this very fun game. 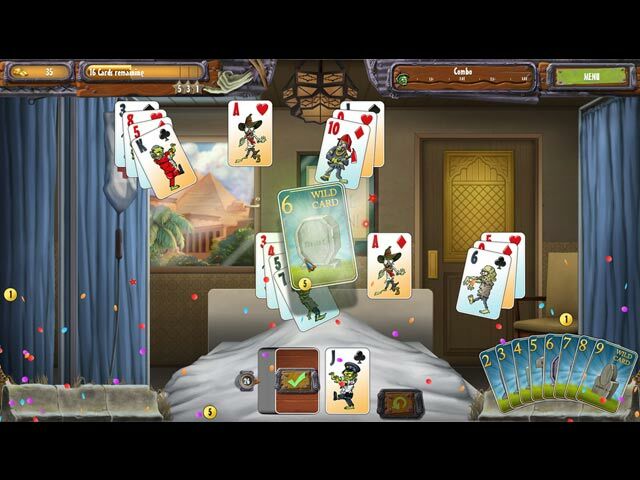 So if you are a fan of solitaire games and even if you hate them give ZS 3 a try. It will not disappoint.